This is a follow-up to a disc devoted to Abrahamsen’s early works for wind quintet plus arrangements of Schumann and Ravel that I reviewed here last year. Whereas the majority of space on the earlier CD was taken up with arrangements, this time around Abrahamsen’s own compositions receive the lion’s share of the programme. As on the earlier disc, these string-based works reveal little of the composer of Schnee and let me tell you. What they demonstrate, though, is a composer in the process of finding his own voice, which may be seen in his development between the earliest piece here, the 10 Preludes, and the Six Pieces of eleven years later. The 10 Preludes, placed last on the disc, display a broad variety of influences from the music of Abrahamsen’s mentor, György Ligeti, to the Danish New Simplicity movement. Trine Boje Mortensen, in the CD notes, sees the two sides of the composer, the magical and the simple as “fruitful opposite poles in many of the composer’s works” all the way to his recent compositions. The opposites are clearly present in the early string quartet. These so-called Preludes cover the gamut from screaming ostinatos in the beginning of the first prelude to folklike material and quasi-Romantic themes in some of the later ones. Abrahamsen sees the fifth prelude as the quartet’s centre of gravity, which contains repeated ticking notes, suggesting the measurement of time that underpin chords on top. Some of the preludes, such as the third and sixth, are slow and reflective, while the seventh shows the influence of Ligeti with its repeated notes on high strings accompanied by pizzicatos that remind me of the earlier composer’s mechanical music. The eighth prelude in ¾ time is folklike and the ninth is pensive and quite beautiful. Then the listener is completely thrown off guard with the last prelude that is a light and joyous Baroque dance. It sounds nothing like any of the others and could have been composed in the early eighteenth century. Is Abrahamsen just taking a look at the past, as the CD notes indicate, or merely playing with the listener? In any case, this rather odd quartet receives a fine performance by Ensemble MidtVest. The other original work, Six Pieces for Violin, Horn, and Piano, begins the disc’s programme and is a much more unified composition. Abrahamsen composed the piece for a concert on Danish radio, which included the horn trios of Brahms and Ligeti, and based it on his seven Studies for piano. If one is expecting the virtuosic horn parts one finds in the Brahms and Ligeti works, there will be disappointment. After all, Abrahamsen’s own instrument, when he was a student, was the French horn. The horn’s role is quite discreet in all but one of the six pieces, the fifth, titled “Scherzo misterioso.” Unlike the 10 Preludes, whose movements give no descriptive indications as to tempo or mood, but just have numbers, each of the Six Pieces has a title. The piano plays the dominant role throughout, which makes some sense due to the work’s origins, and much of the music is rather static. This is especially true of the first piece, Serenade; the third, Blues; and the fourth, Marcia funebre. The last-named piece serves a similar function to that of the fifth prelude in the 10 Preludes, as the centre of gravity. The second piece, Arabesque, has a flowing theme played by the violin with the horn and piano rippling underneath. The only really light and fast movement is the Scherzo misterioso, where the horn and violin get interesting parts and the horn has more of a workout later on. Still, even here the piano tends to dominate. This leads directly into the last piece, For the Children, with the piano playing a simple, block-like tune and the violin producing harmonics above it. 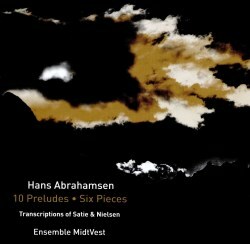 The Six Pieces show some advancement on Abrahamsen’s part, as he is starting to find his own voice. Again, the instrumentalists here do not disappoint. The two arrangements leave a lesser impression, both of which were occasioned by a group of musicians from the Aarhus Symphony Orchestra while touring Karen Blixen’s house in Kenya. Their oboist needed something to perform alongside the Mozart Oboe Quartet. Thus Abrahamsen complied, using Debussy’s arrangement of two of Satie’s Gymnopédies as a guide and Nielsen’s Fantasy Pieces for oboe and piano. I find the Nielsen arrangements more successful than the Satie. It would be difficult to improve on Debussy’s deft orchestrations of the latter with their delicate colours provided by soft strings, harp, and flute, as well as oboe. The solo oboe throughout in Abrahamsen’s arrangements gets a bit wearing and can become piercing, exacerbated by the rather close recording. The Nielsen pieces, on the other hand, lose little without piano and even gain something with the string trio. While the oboe dominates, the strings also have fun with the original piano part in the second piece, Humoresque. In general this disc is recommended for Abrahamsen completists, though the original compositions are not without interest and show how the Danish composer was developing in the 1970s and 1980s.